When I think of reliquaries as defined by shrines or ancient holy relics, then it causes me to marvel even more at the way God entrusted His sacred self to be housed within our souls. The bare bones of holy breath get to take up residence in souls of dust. We cannot ever measure the depth or extent of it in our minds or lives. But we can become aware of the measures God has taken to connect with us. Because the bible reveals the awe-inspiring holy wonder of Easter, when Jesus came to live on earth, die for us and dwell forever in our hearts. Though we have our part to play in receiving His presence, as we recognise the barriers of our bad behaviour, turn away from those things and embrace His mercy and grace. God doesn’t force entry into our hearts. We can resist, ignore, tell Him to go away. Or we can open up, confess our sin and failure and invite Him to come in. God gave us life and breath, and He waits patiently for us to recognise our need of His immeasurable, unconditional love so that He can fully inhabit our hearts. I’m grateful to be linking my poem with the fabulous five-minute-friday writing crew gathering at Kate Motaung’s place. You are welcome to join us here as we write on this week’s prompt of “measure”, and read the great posts being shared. Friends, I’m needing to pause my poetic thoughts for a few weeks in order to visit family, celebrate Easter and rest. Meanwhile, you might like to take a look at my latest book, which is an eclectic collection of poetry, soul exhale reflections and blessings. Perhaps you could treat yourself to it for Easter or Mothering Sunday/Mother’s Day? 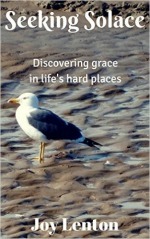 It’s called Embracing Hope: Soul Food to Help Chase Away the Blues and it’s available now on Amazon Kindle. A paperback copy will follow in due course. What might having an abundant life look like to you? Is it possible to have a “more than” existence with less? I believe it is. Although it has taken years of shifted thinking and spiritual digging to discover the truth of a less is more kind of life. When I was a nurse, running madly around a ward all day, with a home and family to take care of as well, the idea of more meant extra time out and time off. Having a hot, undisturbed bath. A book to read. An ability to rest. A meal cooked by my husband. Those were luxuries to me. But when I first became sick with M.E, I saw that time itself wasn’t such a gift. It’s how we spend our hours that counts. If you spend your days flat-out with fatigue in a darkened bedroom, unable to participate in life and full of pain, time seems like a cruel punishment, while the hours stretch endlessly. I felt like an 80-year-old in a 30 something’s body. As my condition became less severe sometimes, quality time with loved ones became my most precious priority and sought after soul resource. Then my insecure soul felt that the essence of more was encapsulated in purchasing and accumulating stuff. It’s not. Because I was trying to plug an unaddressed sense of pain and loss. Consumerism is a vicious hamster wheel kind of circle, whereby enough is never enough to try to assuage or feed our inner hunger. And it’s left me with a huge decluttering problem to tackle too. Eventually, with additional physical health challenges and concerns, my eyes were opened to the inestimable worth of Simply. Being. Alive. I’ve realised I have more than enough because I already have all I can access of God’s mercy, grace and love. I’m linking my five-minute-friday tanka pentaptych poem in community with fellow writer friends here as we share our thoughts on the prompt of “more.” May we all believe we are more than enough even when we feel like our lives or words are insufficient. And seek God Himself more than anything else. As I considered how to start this season of Lent, what struck me forcibly was the symbolism of Ash Wednesday, which is where we begin. Even though my home church doesn’t participate in Lenten practices, I see the value in them. A smudge of Palm Sunday’s ash pressed on the forehead is a visible and powerful reminder of why Jesus came to earth. to all—would it bleed scarlet-red? like an indelible tattoo, perhaps? went for our cleansing hot bath. keep the dross God only knows. We can delude ourselves into thinking we are better than we are. Or we can become deceived into believing nothing good resides within at all. The truth is a mixture of them both. Left to our own devices, we are fallen and lost. But God… picks us up, heals, redeems and restores our souls, calls us His precious Beloved and makes His home in our hearts. That’s what Easter is all about. A Divine exchange takes place. Our filthy rags for His royal robe of righteousness. Our sin for His grace. Our pain for His peace. Our tears for His oil of joy. God excels in bringing beauty out of ashes. He isn’t fazed by our brokenness because He alone can piece us back together. God’s holy glue makes us better than before, with a gradual sanctification process as we surrender our lives to Him. I’ve been on a search. All my life. But I didn’t always know it. It began in childhood, as I reclined on grass, looking upwards, with drifting angels in my eyes. Even floaters took on a spiritual significance in my child heart that ached to be somewhere else. We have been hardwired to seek after truth, to yearn for beauty beyond ourselves and to want more than this earth can provide. It’s a holy space, a vacuum nothing else can fill. Although we might ignore it, or try to stuff it to the gills with earthly pleasures and desires, it remains. An eternal longing that never quite goes away. My eyes were finally opened to the heart of God beating within when I was in my late teens. My search for unconditional love, affirmation and acceptance was found in Christ. His love still overwhelms my soul. The miracle is that He seeks us out first. God’s love also opened my eyes to search more diligently for the living reality of His presence with us, His sacred footsteps in our midst. Because those who seek will find. Those who are thirsty will be satisfied. Our deepest soul ache and emptiness is assuaged and filled by being in relationship with God. Can it really be that we can see the glory of God? Is it truly revealed to fallen, sinful us? What is the glory we can encounter if we believe? Is it nothing less than the faith in Christ we receive? while we live and move and have our ordinary being? as seen in his character and revealed in Jesus on earth. It’s the essence of his all-encompassing presence. It’s the heartbeat of heaven and a gift that is given. It’s light immortal, unapproachable, hid from our eyes. It’s a revelation of holy wonder, unalloyed delight. up to us like the sudden blossoming of desert flowers. us search hopefully for answers for the rest of our lives. that leaves us breathless with awe and has no ending. and through bright sunset rays, full of heat and energy. It’s a call to action, stirring our souls into liveliness. It’s a deep revelation of God’s great power and grace. God keeps most of his glory hidden and out of sight. There are times when my illness hurts my heart just as sharply as it affects my body. I experience an emotional pang on the inside. It rises when I am brought face to face with my limitations. And it feels as if I’m looking out on the world from behind a thick hedge. It doesn’t happen often but it stings, nevertheless. Yesterday we had the pleasure of our young grandson visiting us for a few hours. I had worried in advance because I thought he might get bored in our rather sedentary company, and we might struggle to entertain him. The rest of the week had been very physically active for him as he went out and about with his granny, aunt and cousins. But I needn’t have feared. God ensured that time with us would be a welcome quiet breather in his otherwise hectic schedule. It flew by and we loved it all. And yet, when I heard about his earlier exploits, the heart wound of inadequacy became freshly opened. I mourned my lack of physical health and strength, and in doing so I nearly failed to savour the strong bond we have with him. It’s no less real or important for being different. Fatigue and pain are high today and I didn’t think I could write anything. Until I flicked through my files and found this here’s-one-I-made-earlier poem, which seemed perfect to share. for the one who is known as King of kings. because it just can’t be enough, can it? weary and sick, where deformity sits. and the pain and stiffness she bears. him with ungainly feet and aching limbs. face and draws her into a loving embrace. are ocean-drawn gifts and precious pearls. a different kind of existence to be living. I delight to pour into your soul’s reservoirs. and a surrendered soul, just as you are. Friends, let’s try to remember that our inadequacy is no match for God’s grace. He fills our insufficient souls with His equipping presence and love. He gives us strength when we feel weak. He holds us close when we are hurting. We don’t need to drown in discouragement, only rest in the One who knits us back together again. God alone can heal what is broken and wounded in us, including our thoughts.